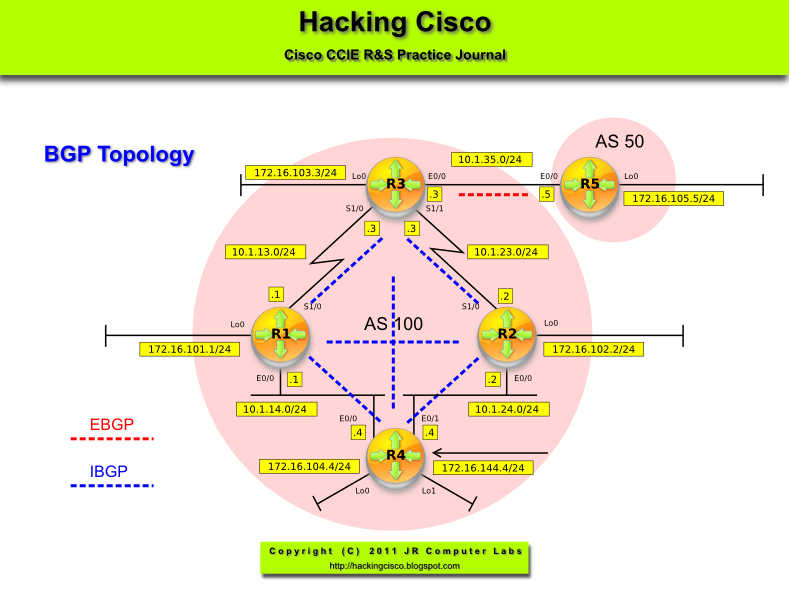 Configure full mesh BGP peering according to the topology diagram (pic. 1). Make sure that all BGP sessions in AS 100 can survive a single link loss. If IGP protocol must used, OSPF should be configured. Advertise Loopbacks into BGP. Configure R3 in such a way so the response time of BGP to adjacency changes is improved. Use a method of detecting the loss of the peer that is not based on the interface state but is event driven such as a loss of the path to the IGP address used for peering. Configure full mesh BGP peering according to the topology diagram (pic. 1). Make sure that all BGP sessions in AS 100 can survive a single link loss. If IGP protocol must be used, OSPF should be configured. Advertise Loopbacks into BGP. Pic. 2 - R1's BGP Neighbors. Pic. 3 - R2's BGP Neighbors. Pic. 4 - R3's BGP Neighbors. Pic. 5 - R4's BGP Neighbors. Pic. 6 - BGP Fallover.